Fishing topwater during the summer almost always results in the best strikes, especially when a bass charges the bait from below and blasts out of the water with it. Topwater lures are primarily designed to imitate injured bait fish, which makes it hard for a big bass to resist such an easy meal. The reason bass are so active and aggressive during the summer is because of the warmer water. Bass are cold blooded, so the temperature increase in the water speeds up their metabolism which creates a need for more food, therefore they pursue bigger baits with more energy. Ultimately this results in bass fisherman getting some incredible topwater action during the summer, and a great fight! Choosing which topwater lure to use can be difficult. Some days the bass are drawn in by the splashing from a Rapala Skitter Pop, while other days they may be more interested in a lure with a ‘walk the dog’ retrieve. Finding the right lure on the right day definitely requires some experimentation, so try to keep a variety of topwater lures available when you’re out fishing. When choosing the color of your lure try to match it to the color of the bait fish that you see or the foliage surrounding the area. Black is the best color for night fishing because it has the best contrast from below the surface. Water clarity can also influence color choice. If the water is very stained or murky then it is better to use a bright colored lure with some sort of noise to attract the attention of the bass. However in clear water a bright lure may spook the bass, so it is better to go with more subtle colors to mimic their natural food source. The choice for a topwater lures can be broken into poppers, chuggers, propbaits, stickbaits, buzzbaits, and plastics. All of these lures have their advantages as well as disadvantages and choosing the right one depends on a lot of different conditions. Some of these conditions include weather, the time of day, the bass activity, the cover on the lake, the underwater topography, and many other factors. For example, if you are having trouble locating bass, a buzzbait is a good lure to use because it can cover a lot of surface area fairly quickly and help locate bass. The best topwater lures I have found for Florida bass fishing in the summer seem to be the Rapala Skitter Walk, the Rapala Skitter Pop, and the Stanley Ribbit Frog. These have consistently performed the best for landing bass and between the three of them, they are diverse enough to cover topwater lures for almost any day. I definitely always keep these three lures in my tackle box during the summer. 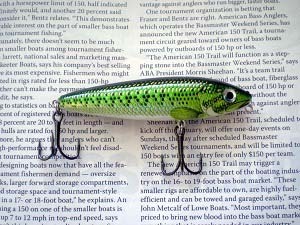 The Baby Bass color has proven to be one of the best color choices for this lure for largemouth bass on Florida lakes. It uses a weight inside the lure that makes the ‘walk the dog’ motion a breeze. The Skitter Walk works best with a stop and go retrieve, making sure you let it sit just for a second in key spots. The internal rattle is great for attracting bass and the motion will almost always provoke a strike. Construction is a plastic body and a weighted tail. The Skitter Walk is definitely a great lure for calm days especially when worked along the weed line. The Skitter Pop is on the list because, in my opinion, it is one of the best made poppers on the market. In general, Rapala makes very good quality lures and the Skitter Pop obviously shows that. It has a balsa wood body and a plastic cupped lip that provides the surface agitation. It spits up plenty of water to mimic bait fish at the surface and just has a great pop and feel about it. The 2-3/4” frog or shad color seem to work best for summer fishing and the heavier lure allows for longer casts. 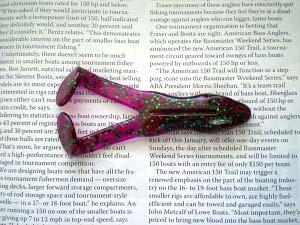 I have used the Watermelon, Lily Pad, and Royal Shad colors of the Ribbits, and they all work great. The feet of the lure throw up water at the surface which must be irresistible to the bass because they just absolutely smash it. It is best worked at a medium retrieve in order to keep it on the surface with occasional stops thrown in. 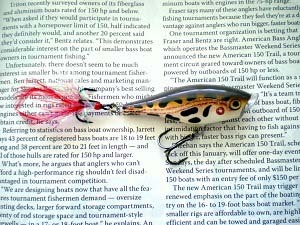 Hook the Ribbit Texas-rigged and let the hook barb rest in the groove on the top of the frog. Another way to hook it is to use a Ribbit Double Take Hook, I have not personally used one of these hooks, but I do want to give it a try.